Step A: Lock your eyes often….. it helps connect and makes two people fall deeper in love! Step B: Hold hands… get that touch… the warmth of your partner will reach straight to your heart! Step C: Don’t be afraid to get naughty at times…. It creates magic! Step D: Give surprises of all kinds… woo your sweetheart a million times! Step E: Anger, arguments and fights are damn cool; coz the patch up later makes love sizzling hot! Step F: Don’t mind that passionate kiss… it will tell you how much you’re loved and missed! Step G: Don’t ignore those secret fantasies, share them, enjoy them and whenever possible…. Live them! Step H: Sometimes… drink from the same cup… it strengthens the feeling of togetherness! Step I: Make jealous…be jealous… coz jealously adds spice to love! Step J: Express love… nothing better works than showing how much you love your beloved! 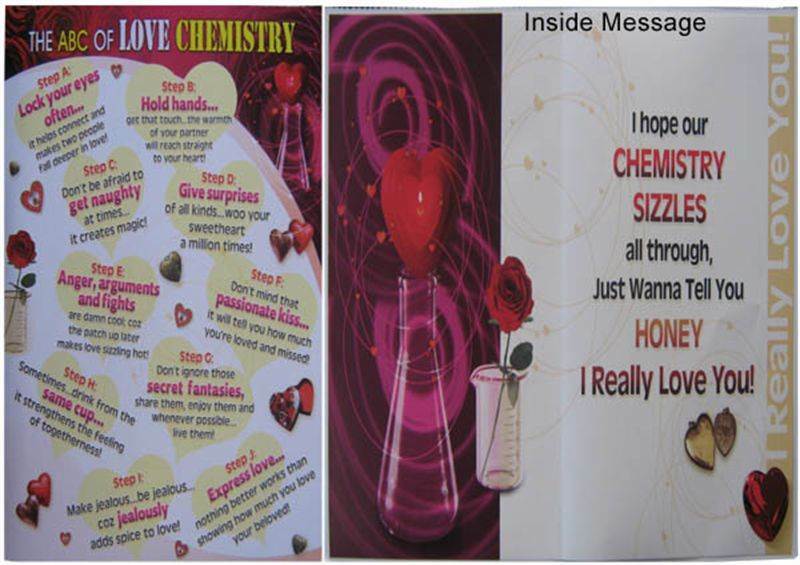 Inside message: I hope our Chemistry sizzles all through, just Wanna tell you HONEY I really Love You!